The poem by Shakespeare now known as “The Phoenix and Turtle,” or “The Phoenix and the Turtle," was first printed with no title; it was one of several additional poems in the 1601 publication of a long poem by Robert Chester. In the classical tradition, the mythical phoenix consumes itself in fire, from the ashes of which another phoenix is born. In Shakespeare's poem, the phoenix is female and the turtle (that is, a turtledove) is male. The poem has been interpreted in many ways. The phoenix and turtledove may die in a fire that produces a new phoenix—or may not produce offspring. Some see the poem as a celebration of their physical union. Others suggest that the two become one as they approach a Christian heaven, or offer a philosophical reading. Some even link them to historical figures, although such interpretations are no longer widely favored. In the poem's first part, sometimes called the "session," birds assemble to sing the second part, or “anthem." The anthem celebrates the phoenix and turtle's love and introduces the figure of Reason. Reason composes the final “Threnos” (a dirge), which many find the most beautiful section. 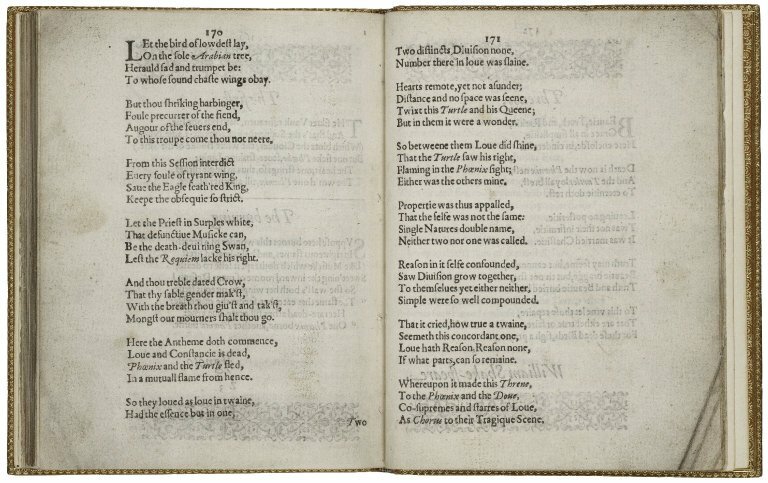 You can read the poem online or buy it in the Folger edition. Loues martyr: or, Rosalins complaint· Allegorically shadowing the truth of loue, in the constant fate of the phœnix and turtle. Chester, Robert, fl. ca. 1586-1604.